I often hear how expensive it is to eat “Vegan”. 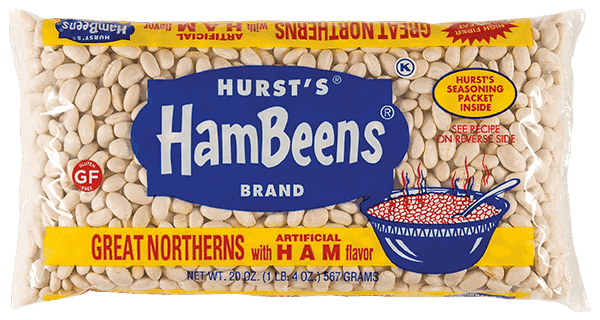 My reply would be they obviously have not priced dried beans, because this little 1 lb package of Great Northern Beans from my friends at Hurst’s Hambeens ®” costs less than a couple of bucks, and will practically feed an army! Especially when you make this killer Vegan Ham and Bean Soup in your Instant Pot. Cooking dried beans used to be an all-day chore, what with the soaking and the simmering. But with the invention of the Instant Pot Pressure Cooker, now you can have a homemade Vegan Ham and Bean Soup like this in about an hour. And don’t let those little packages of beans deceive you. A 1 lb bag of dried beans will yield about sixteen 1/2 cup servings, and that does not take into consideration the other soup ingredients we are going to add. Let’s just say a bag of beans will feed you and your family for at least a few days if not longer. Now let’s talk nutrition. Because as well as being “too expensive to eat this way”…. Vegans can not possibly get enough protein either. Right? Great Northern beans are an excellent source of protein. For 209 calories, a 1-cup serving will give you 15 grams of protein with less than a gram of fat. Plus, beans are full of fiber, the indigestible part of plants that helps regulate blood sugar and makes you feel full longer. One cup of Great Northern beans contains 12 grams of fiber, or about half of your daily needs. And before we get on with the recipe, I just wanted to give a quick shout-out to NK Hurst for reaching out to me. This is a 4th generation FAMILY RUN business that was started in 1938. 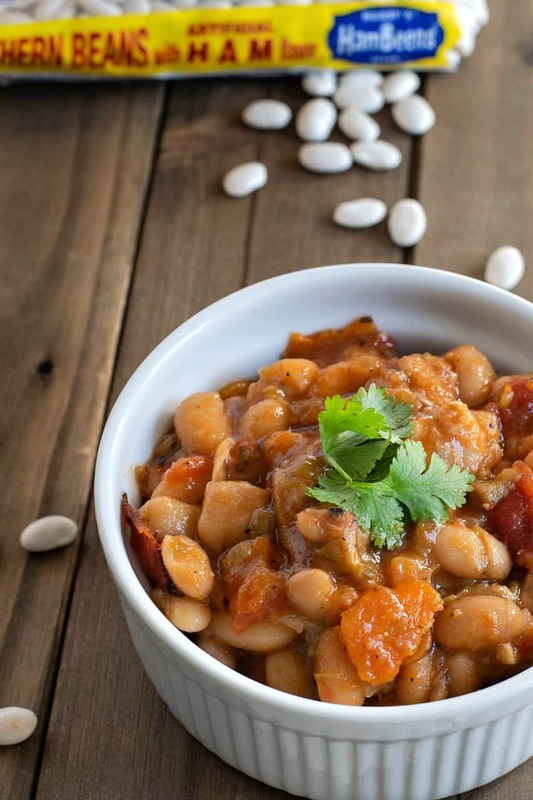 I love beans and to me, there is no better way to dispel these money and protein myths that have evolved around Plant-Based eating than sharing a good bean soup recipe. And I was assured by the great-grandson of the founder himself – that all the ingredients in each bag of Hurst’s Hambeens are indeed 100% vegan. Start by using the SAUTE function on your Instant Pot to soften 1 medium diced onion, 2 medium sliced carrots (about 1 cup), and about 1 cup of diced portobello mushrooms. Add just enough water or veg broth to prevent sticking. When the veggies have softened, press the KEEP WARM/CANCEL button and add a 4oz can of Green Chiles and 3 cloves of minced garlic and stir. Now we add our liquid. Add 3 cups of Low Sodium Vegetable Broth and 3 cups of water. Stir well. 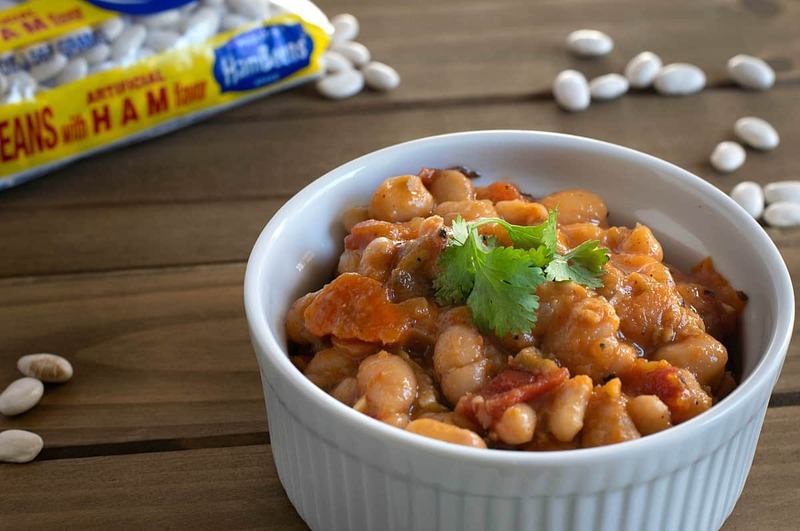 Rinse your 1lb bag of Hurst’s Hambeens Great Northern Beans (set aside the spice packet) and stir the beans into the soup. To season we’re going to add the contents of the spice packet that came with the beans, 1 tsp Mexican Oregano, 1/2 tsp Ground Cumin, and 1/2 tsp Smoked Paprika and stir well. Finally, we’re going to add a 15oz can of Fire Roasted Tomatoes directly into the center of the soup and DO NOT STIR. Attach the lid, set your vent to SEALING, and we’re going to cook our soup for 40 minutes on MANUAL. When the soup has finished cooking, allow it to naturally vent (NPR) for 15 minutes before manually venting any remaining pressure. Stir well and serve, garnishing with fresh cilantro if desired. Be warned, this is one of those recipes where a good, down-home hunk of fresh Vegan Cornbread would be an amazing side! Once veggies have softened, press KEEP WARM/CANCEL and add chiles and garlic – stir well. I love bean soup and before becoming WFPB, I loved Ham and Bean soup! I plan to put this on my menu for next week. Nothing better on a crisp fall day than bean soup. Thanks and congratulations on the sponsorship! Love the recipe but how can I make it in my slow cooker? If using a slow cooker, I would definitely soak the beans overnight. Or use a quick soak method where you bring them to a boil, turn off the heat, and then cover them for an hour or two. Drain, rinse and then add with everything else to your slow cooker. Perfect time of year for a pot of beans. This sounds delicious. It’s on my menu for tomorrow! Since I can’t buy Hurst’s beans where I live what do I do about the seasoning packet? The bulk beans I buy do not come with one. Am I out of luck? You could use regular dried Great Northern Beans and simply add your own seasoning. I would use the other seasonings I listed in the recipe as well as a little salt, maybe 1/2 tsp. Adjust to taste. If you don’t have the Hurst beans what would suggest as spices in addition to the ones in your recipe? My Local grocery story didn’t have their Great Northern Beans, but they had the 7 bean soup. Got them, assembled the ingredients, followed the instructions…and could NOT find the seasoning packet! I apparently hid it from myself! So I added some soy bacon bits. Worked great! The beans are delicious! Big hit w/ the fam. I’m sure I will find the packet when I do the dishes or make tea later. That’s ok. I’ll use it next time. Do you know what the mg of sodium is for the seasoning packet? I’m sodium sensitive and avoid using it. 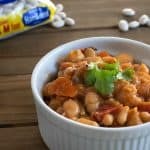 I love northern beans and happy to see a vegan recipe using them. Get tired of black beans. Great job, thank you! The ingredients are listed on the Hurst website, thanks. The only thing that concerns me is the flavor packet, It contains Hydrolyzed Soy Protein. Since 90% of the soy grown in the US is GMO, I will pass on this recipe. I personally believe GMO’s have not been independently tested and I can not chance the health of my family on the word of a company that has previously lied about the safety of their products such as DDT and Agent Orange. The recipe is not centered around the spice packet. It’s the beans that make the recipe. If you choose not to use the spice packet, fine. Add your own seasoning. This recipe looks amazing. I am in the Vancouver, Washington area, where can I buy this brand of bean? I found out where the beans are sold! Delete my comment. They are listed on the Hurst website, thanks. Looks yummy! Chuck, can you post a photo of the ingredients label on the bag, please? Thanks! Would a little liquid smoke give you that ham flavor? There is smoked paprika in the recipe too. But you could add more, sure. Love all your recipes! These looks like another winner, thanks. Super excited for your sponsered recipe! Great recipe. Made tonight on our first near freezing night in Ohio. Instead of the spice packet I used 2 T of ground dried New Mexican chili peppers and 1 tsp of Braggs. Perfection! Thank you for this rich & wonderful soup recipe. I made this and my wife and I LOVED it! The mushrooms give a nice “meaty” texture to the soup, and the flavors are perfect. Yet another home run by Chuck!! I’m making this bean soup today. Love bean soup so I’m looking forward to enjoying a bowl of this with the corn bread from your reciepes. Thanks for this recipe. Love this recipe! Thank you, Chuck! My soup needed 10 more minutes under pressure to soften the beans. Thank you for this recipe Chuck. Glad you partnered with Hurst’s Hambeans. My non-plantbased family will eat this, too! This was easy, hearty and delicious. The way mine turned out I would give me 4 stars, because I didn’t have low sodium veggie broth, just the regular kind, and it was pretty salty. Also, I think next time I will pressure cook for a little bit longer because I prefer my beans a little creamier. But damn, having dry beans be edible in 40 minutes is pretty awesome. I also used dried Shiitake mushrooms because I love the texture of them in soups and I took the suggestion and served it with vegan cornbread. which was done at exactly the same time as the soup after prepping the soup first, so as far as time management is concerned, this was the perfect meal. Thank you for the great ideas and recipes!